Much of the critical consensus around Little Boy — the 2015 American movie upon which Tubelight is based — condemns the movie as an offensive form of religious chauvinism. Armed with that foreknowledge, I expected Tubelight to be a disaster. Thankfully, it is not. Though flawed, it’s an enjoyable and touching examination of the lives of loved ones left behind during times of war. Tubelight resets Little Boy‘s story from World-War-II-era California to the small mountain town of Jagatpur in far northern India during the Sino-Indian War of 1962. Americans can be forgiven for not remembering this conflict, as it happened at the same time as the Cuban Missile Crisis. Tubelight also recasts the titular “little boy” from the original film with 51-year-old Salman Khan. Khan plays Laxman, a mentally handicapped adult whose nickname “Tubelight” refers to the long time it takes for him to catch on to concepts. His younger brother Bharat (Sohail Khan, Salman’s actual younger brother) is his bodyguard and cheerleader, encouraging Laxman to believe in himself, even if no one else does. The pair feature in a song number about brotherly love made awkward by the siblings’ stiff dance moves. The most uncomfortable aspect of Tubelight is the degree to which the town condones the bullying of Laxman. Young and old alike feel free to laugh at Laxman for even minor gaffes, and everyone seems okay with this. It’s sad. Besides Bharat, Laxman’s only defenders are kindly Maya (Isha Talwar) and scholarly Banne (Om Puri). It falls on them to look after Laxman when border tensions between India and China inspire Bharat to enlist. As the conflict escalates, Laxman struggles with his loneliness and inability to bring Bharat home. In order to keep Laxman busy, Banne encourages him to practice living by Gandhi’s principles, such as conquering fear and loving one’s enemies. Laxman thinks doing so will increase the strength of his belief, thereby empowering him to will his brother’s return. He puts Gandhi’s values into action when a widowed mother named Liling (Zhu Zhu) and her young son Guo (Matin Rey Tangu) move into a house on the outskirts of town. Though Indian by birth, their Chinese ethnicity marks them as outcasts. Laxman overcomes his own trepidation to befriend the little boy, earning him the ire of many townsfolk. The indulgence by Banne and other villagers of Laxman’s fantasy that he can change things if he just believes hard enough feels wrong. Laxman isn’t a child who will one day come to understand that people were humoring him. He simply isn’t capable. Liling is the only person who reasons with Laxman honestly, trying to explain things in terms he can grasp. She stresses that bad things don’t happen because of a lack of faith, and that self-belief is important for its own merits, not because it can work miracles. Moments like the conversation between Liling and Laxman give Tubelight authenticity. While Laxman may be particularly ill-equipped to handle something as horrible as war, everyone feels helpless when their loved ones are in danger. For all his intellectual shortcomings, Laxman is quicker to appreciate the distinction between individuals and governments than the rest of Jagatpur. He sees Guo and Liling for who they are, not as representatives of some hostile foreign power. Such surface-level hatred is personified by the town bully, Narayan (Mohammed Zeeshan Ayyub). He’s an effective villain because his racism and xenophobia are reflexive and just understated enough that people are willing to follow him. He hears that a Chinese family has moved to town, and his instinct is to attack them. The speed with which he reacts makes it seem as though it is the natural way to react. It’s chilling. Little Matin Rey Tangu is charming as Salman’s sidekick. They share a funny scene in which Laxman confesses his lies, only to run away before he can face the consequences. Zhu Zhu gives a solid performance, and watching her dance is a treat. Om Puri and Sohail Khan are great in a scene in which they discuss how Laxman will cope without Bharat. Salman is overall pretty good, but he’s at his best during moments of heightened emotions, such as when Laxman is afraid for his brother or when he’s protecting Guo. His earnestness drives home the importance of rejecting racism and xenophobia as a way to free ourselves from fear and spread peace. This entry was posted in Reviews and tagged 2.5 Stars, 2017, Bollywood, Hindi, Indian, Isha Talwar, Little Boy, Matin Rey Tangu, Mohammed Zeeshan Ayyub, Movie Review, Om Puri, Salman Khan, Sohail Khan, Tubelight, Zhu Zhu on July 6, 2017 by Kathy. Phantom is a revenge fantasy inspired by the 26/11 terrorist attacks on Mumbai. As political wish-fulfillment, the movie is entertaining enough, but it isn’t truly satisfying. Phantom opens with a short primer on the attacks that includes harrowing actual news footage. Then the film’s hero, “Jude” (Saif Ali Khan), makes his entrance in unheroic fashion. He engages in a road rage car chase through Chicago that ends in him punching a man who falls to his death in the Chicago River. “Jude” is an alias of Daniyal Khan, a dishonorably discharged Indian Army officer on a secret mission to assassinate the four masterminds of the 26/11 attacks. His mission first takes him to London, where he meets his contact, Nawaz (Katrina Kaif). Nawaz has a complicated job description. She works for the not-so-subtly-named US military contractor Dark Water, coordinating security for refugee camps run by Medicine International, who she may also work for. Daniyal kills the man Nawaz is hired to identify — a high-ranking terrorist trainer — and she is furious for being dragged into his deadly scheme. Still, when she gets a coded phone call from Daniyal, she agrees to help him in his next mission: exterminate David Coleman Headley in jail in Chicago. While Daniyal receives off-the-record assistance from India’s intelligence agency, their counterparts in Pakistan conclude that the deaths of such prominent terrorists are connected. The Pakistani agents try to identify the man responsible, but Daniyal is always one step ahead of them. 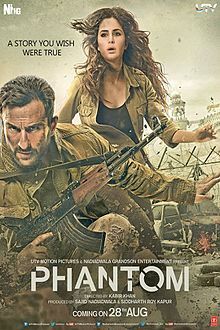 Phantom has an apt tagline: “A story you wish were true.” The notion of one man, freed from political constraints, taking out not one, but four of the most wanted terrorists in the world is immensely appealing. Getting to join him for the ride — with all its accompanying car chases, fist fights, and espionage — makes it even better. Still, there’s a nagging feeling throughout the film: it couldn’t happen like this. It took ten years and a whole team of US special forces soldiers to kill Osama Bin Laden. One guy with no advanced military training taking out four terrorists in the span of a few months? It all comes too easy for Daniyal. His most perilous moments consist of him bobbling something in his hand and being delayed by a stalled auto-rickshaw. There’s no one on the ground tracking him; the Pakistani agents gather their information on him remotely. As a result, the movie lacks tension. Director Kabir Khan wisely resists forcing a love story into the narrative. Daniyal has bigger fish to fry, and Nawaz is rightfully wary of him. Focusing on the two leads as professionals, not lovers, also frees Khan and Kaif to give grounded performances. One other performance needs special acknowledgement. Mohammed Zeeshan Ayyub, who plays the Indian intelligence officer who masterminds the mission, deserves some kind of lifetime achievement award for persevering in the face of nonsense. This time, he’s forced to give a corny speech, urging Indian naval officers to pluck up their courage and buck orders for the sake of this one man — this one man! — who was willing to risk his life for India. Ayyub’s speech is part of a third act that is cheesier than the rest of the film. Fortunately, Director Khan ends Phantom on a contemplative note that befits the seriousness of the events that inspired it. We can wish for an easy path to justice, but we can never take it lightly. This entry was posted in Reviews and tagged 2.5 Stars, 2015, Bollywood, Hindi, Indian, Kabir Khan, Katrina Kaif, Mohammed Zeeshan Ayyub, Movie Review, Phantom, Saif Ali Khan on August 28, 2015 by Kathy. Tanu Weds Manu Returns is the feel-bad romantic comedy of the year. Lighthearted moments are undercut by a cynicism about the institution of marriage that leaves one feeling melancholy at best, depressed at worst. 2011’s Tanu Weds Manu was a conventional romcom about a pair of opposites: wild-child Tanu (Kangana Ranaut) and steadfast Manu (R. Madhavan). Tanu Weds Manu Returns (TWMR, henceforth) picks up after the first four years of their miserable marriage. Tanu is so desperate to get out of her marriage that she has Manu committed to a London mental institution. She later feels bad, calling Manu’s friend Pappi (Deepak Dobriyal) to rescue her husband while she flies back to India. The couple wind up at their respective family homes in different cities (the geography in TWMR is confusing for international audiences). Tanu flirts with her parents’ tenant, Chintu (Mohammed Zeeshan Ayyub), and unwisely reconnects with her short-tempered ex-boyfriend, Raja (Jimmy Shergill). Manu notices a college athlete who is the spitting image of Tanu, only with a pixie cut. He stalks Kusum (also Ranaut) until she relents, and they start dating. Manu falling for his wife’s younger lookalike is a cute story setup, but it gets creepier the more serious the relationship becomes. Pappi warns that the new relationship is a bad idea — especially since it begins before Tanu and Manu are officially divorced — but he doesn’t call Manu’s obsession what it is: weird. It hard to know who to root for in this movie. Tanu and Manu are both incredible jerks to each other. Tanu is arrogant and lacks empathy. Manu is selfish but wishy-washy. He doesn’t even possess enough will to make his climactic decision on his own, without prompting. Worse, TWMR makes the characters’ circumstances so dire that its impossible to resolve the story in a satisfying way. There are really only a handful of things that one spouse could say to the other that would permanently destroy their marriage. When Tanu is at her most pitiable, Manu says one of those things to her. It’s crushing to watch. Director Anand L. Rai and writer Himanshu Sharma give themselves only two possible outcomes: either Tanu and Manu get back together, or Manu weds Kusum and says good-bye to Tanu forever. Neither option feels good, and both are bad for Kusum. Kusum is the movie’s redeeming element. She’s an independent tomboy, but she’s also sweet and honest. She’s reluctant to get romantically involved with anyone because, if the relationship negatively affects her athletics, it will make it that much harder for other girls from her village to get scholarships in the future. That Manu pursues her anyway is a sign of his selfishness. Ranuat’s acting abilities are widely acclaimed, and it’s fun to see her pull off two very different roles in the same movie with such ease. Dobriyal is also entertainingly twitchy as Pappi. Manu’s not much of character as it is, and Madhavan doesn’t add much. In addition to an unsatisfying story, international audiences will be hampered by poorly translated subtitles. Minor spelling errors — such as writing “apologies” instead of “apologize” — hint at greater problems in translating the humor from Hindi to English. The crowd of mostly native Hindi speakers at my showing laughed uproariously to lines that, in English, read as utilitarian. Watch Tanu Weds Manu Returns for Kangana Ranaut. Just don’t expect to have a lot of fun while doing it. 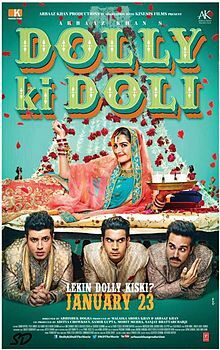 This entry was posted in Reviews and tagged 2 Stars, 2015, Anand L. Rai, Bollywood, Deepak Dobriyal, Himanshu Sharma, Hindi, Indian, Jimmy Shergill, Kangana Ranaut, Mohammed Zeeshan Ayyub, Movie Review, R. Madhavan, Tanu Weds Manu, Tanu Weds Manu Returns on May 22, 2015 by Kathy. The best and worst aspects of humanity are on display in Shahid, a biographical film based on the life of the lawyer Shahid Azmi. Azmi’s assassination while defending an innocent man against terrorism charges embodies the personal and social costs of choosing quick, easy solutions at the expense of the truth. Rajkummar Rao plays Shahid, whose own past mirrors the lives of the men he defends in court. 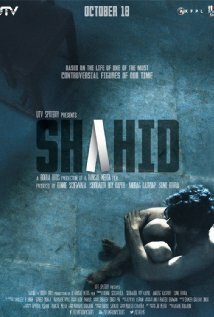 As a teen, Shahid witnesses the gruesome murders of his neighbors in a religious riot in his Muslim neighborhood. Feeling powerless, he joins a militant Islamist training camp, only to flee after a few months. Upon his return home, Shahid is arrested when his name is found in a terrorist’s diary. Torture and coercion at the hands of the police result in Shahid’s imprisonment for seven years. In jail, Shahid finds his calling. Two fellow prisoners — a kindly professor and a reformed militant — recognize Shahid’s intelligence and steer him away from the terror recruiters in the jail. Professor Saxena (Yusuf Hussain) tutors Shahid and War Saab (Kay Kay Menon, who is delightful in every scene) finances Shahid’s studies. On the outside, Shahid finishes his law degree and discovers how easy it is to manipulate the legal system. Shahid’s first case of note involves a computer repair man named Zaheer who lends his laptop to a friend. Unbeknownst to Zaheer, the friend uses the laptop to plan a terror attack, and Zaheer is implicated in the crime. Despite having no direct evidence tying Zaheer to the crime, the prosecutor, More (Vipin Sharma), drags the trial on for years. Shahid’s persistence results in Zaheer’s eventual release and earns Shahid a reputation as a defender of unjustly persecuted Muslims. Shahid himself is violently targeted while defending a man wrongly accused of participating in the Mumbai terror attacks of November 26, 2008. What stands out in the two trials depicted in the film — the real Shahid earned seventeen acquittals in his brief career — is how weak the state’s cases are. More’s stalling tactics are outrageous. In the second case, the prosecutor’s arguments are easily disproved. Why would a government spend so much time and money to convict innocent men when those resources could’ve been spent trying to catch the real perpetrators? The prosecutor in the second case, Tambe (Shalini Vaste), reveals the answer when she says that even citizens who weren’t personally endangered during the attacks now feel scared in their own homes. The government needs to convict someone — anyone — so that the people will feel safe again. As flawed as the justice system is, its agents aren’t depicted as monsters. Prosecutor More has one of the sweetest moments in the film. Following an intense argument with Shahid, More spies a sandwich in Shahid’s briefcase and tries to goad the young lawyer into splitting it with him, dissolving Shahid into giggles. Shahid himself is far from perfect. He’s a lousy husband to his wife, Mariam (Prabhleen Sandhu), a former client. He refuses to address the persistent threats made against him, keeping his family in the dark even though their lives are in danger, too. The character closest to perfect is Shahid’s devoted brother, Arif (Mohammed Zeeshan Ayyub, who’s great in the film). Arif covers for Shahid when he joins the militants and encourages him to study law, even if it means Arif must support the family financially by himself. When Arif finally blows up at Shahid, it seems deserved. Director Hansal Mehta uses the camera to emphasize how the justice system can diminish an individual. During Shahid’s initial interrogation, he huddles on the floor naked, the camera positioned at the ceiling to make him appear tiny compared to the police officer towering above him. In his first difficult days in prison, Shahid tells Arif to stop coming to visit him. Arif is fully in focus while Shahid stands behind a screen, the camera partially fulfilling Shahid’s wish to fade into obscurity. Rao navigates skillfully through all the ups and downs in Shahid’s life. Rao’s infectious smile comes to Shahid’s face easily and often during the character’s first trial and initial courtship of Maryam. As the story progresses and the cycle of unjust imprisonment of innocent men persists, Shahid’s smile all but disappears. This entry was posted in Reviews and tagged 2012, 4 Stars, Bollywood, Hansal Mehta, Hindi, Indian, Kay Kay Menon, Mohammed Zeeshan Ayyub, Movie Review, Prabhleen Sandhu, Raj Kumar Yadav, Rajkummar Rao, Shahid, Shalini Vaste, Vipin Sharma, Yusuf Hussain on May 6, 2014 by Kathy. What a difference perspective makes. Had Raanjhanaa been told from the point of view of Sonam Kapoor’s character, Zoya, it would’ve been a horror movie along the lines of Fatal Attraction. 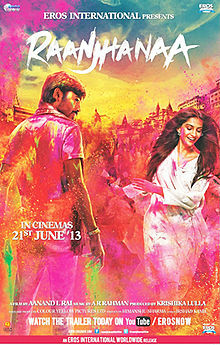 Instead, the main character in Raanjhanaa is a scrappy guy named Kundan (Dhanush). He’s supposed to be a tragic romantic hero, but he’s actually a stalker so possessive of Zoya that he destroys her life. Their one-sided romance starts harmlessly enough. Muslim Zoya and Hindu Kundan grow up in the same neighborhood. He flirts with her, and she doesn’t discourage him. Things progress as far as a hug before her parents learn of it and send her away. Kundan vows to wait for her forever, even though he’s only in tenth grade, and she’s in ninth. 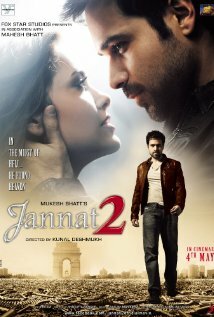 Eight years later, Zoya returns and doesn’t recognize Kundan. When he reminds her that he’s the reason she was sent away, her memory sparks, but romance does not. She laughs off his marriage proposals and makes it clear that he resides in The Friend Zone. Besides, Zoya is in love with someone else: Akram (Abhay Deol), a politically active classmate from college. Akram is everything that Kundan is not: rich, principled, educated, and motivated. Zoya says that she loves Akram because he treats her as an equal, not as an object of worship or a trophy to be guarded. Kundan doesn’t take the hint and instead acts like a manipulative drama queen. He slits his wrists, then stages a sham marriage to his childhood friend, Bindiya (Swara Bhaskar) to try to make Zoya jealous. This is particularly cruel because Kundan knows that Bindiya is in love with him. Ultimately, Kundan robs Zoya of her home, family, love, and future, all because she doesn’t love him in return. What makes Raanjhanaa more interesting than another recent stalker-as-hero movie, Ekk Deewana Tha, is that the movie acknowledges that Kundan is in the wrong. He recognizes his mistakes, and justice is served in the end. Yet the fact that the story is told from Kundan’s perspective is problematic. Most of the movie’s second half is about Kundan trying to redeem himself in Zoya’s eyes, though his actions are heinous enough that he doesn’t deserve forgiveness. The fact that he believes his actions are motivated by love is itself a kind of self-administered absolution, a shield for behavior that would otherwise be deemed evil. Perhaps the story might have been more satisfying had Kundan realized during his atonement that what he feels for Zoya is obsession, not love. The story is all the more tragic because Kundan is a different, more endearing person when he’s with his friends, Bindiya and Murari (Mohammad Zeeshan Ayyub). He’s more relaxed and playful, and the three share a great rapport. One of the movie’s best scenes is when Bindiya reluctantly agrees to help Kundan and Murari sink one of Zoya’s potential suitors, a doctor, by turning a medical check-up into an x-rated encounter. The acting is uniformly good. Sonam Kapoor gives Zoya depth and allows her to grow throughout the film. Dhanush also gives a strong performance. It was nice to see a couple of romantic leading men portrayed by actors who don’t look like professional bodybuilders, for a change. Raanjhanaa is entertaining, even if it is troubling. Zoya spells out exactly what modern women want in a love interest. Time for filmmakers to write their leading men accordingly. This entry was posted in Reviews and tagged 2 Stars, 2013, Abhay Deol, Bollywood, Dhanush, Ekk Deewana Tha, Fatal Attraction, Friend Zone, Hindi, Indian, Mohammed Zeeshan Ayyub, Movie Review, Raanjhanaa, Sonam Kapoor, Swara Bhaskar on July 1, 2013 by Kathy.